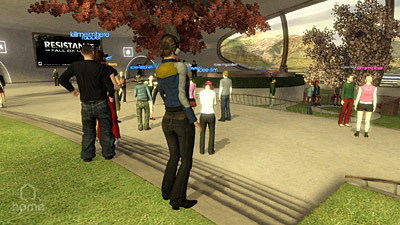 February 2008 - This year's GDC was loaded with cool announcements from every corner of the industry. The Sony camp was determined not to overdo it like they did last year. However, they still gave us a nice look into what's in store for 2008 and beyond. Read on and find out all the info! Sony's Sketch 'n' Scan was one of the most innovative developmental projects on display at the show. The new software utilizes the power of the PlayStation Eye by scanning items, even ones that you have drawn, and reproducing them in interesting ways. For example, gamers could draw terrain, landscapes, and even vehicles in order to have their creations become a functioning part of the game. The software was developed by Sony not as a standalone title, but rather as a tool to be used by subsequent developers in order to harness the power and interesting possibilities of the PlayStation Eye peripheral. The release of Gran Turismo 5 Prologue will be even more interesting than we thought with the introduction of Logitech's Driving Force GT racing wheel. The wheel features powerful force feedback and a 24-position real-time adjustment dial for on-the-fly control of brake bias, traction, and damper settings. Additionally, the force feedback wheel simulates understeer, oversteer, and traction loss with amazing accuracy. It also includes full-size gas and brake pedals for precise throttle and brake response. Wheel owners will be able to use either the stick shift or the wheel-mounted paddles to change gears. 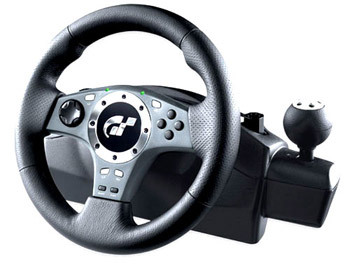 The Logitech Driving Force GT wheel is also compatible with Gran Turismo 3 and Gran Turismo 4 on the PlayStation 2. So GT fans have no excuse not buy this peripheral except for maybe the $149.99 price tag. Look for its release in North America and Europe sometime in early May. Sony gave us a bit more insight into the progress of their Home service. The much anticipated social networking service is currently running a private Beta which runs on Dev. Kit Ver. 0.8 which will soon be upgraded to ver. 1.0. The new version will include tools and support for user created games, clothing, and furniture. Additionally, it looks like the Trophy system talked about at last year's GDC will be incorporated into the Dev. Kit Ver. 1.0. Finally, 3D objects will available for use within Home. Some objects have purely aesthetic appeal while others will actually have expanded functionality throughout Home. For example, you will be able to travel around from place to place and snap photos of your journey with a camera. You can then save those photos and decorate your own space with them. It sounds like Home will be strikingly similar to The Sims.